The UN confirmed Tuesday evening that Mr. Guterres and the Republic of Korea’s President Moon Jae-in spoke by phone on Monday, in which the latter sought “the support of the United Nations” to verify the shutting down of the nuclear test site in the Democratic People’s Republic of Korea (DPRK). Mr. Moon also asked the UN to help implement the recent agreement by the two nations to transform the demilitarized zone. 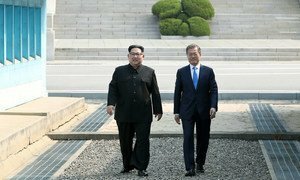 In response, the Secretary-General “reiterated the full support of the United Nations to furthering the inter-Korean dialogue and in this regard pledged that the United Nations stands ready to discuss possible forms of support,” according to a read-out issued by the world body. On 27 April, the leaders of the two nations agreed on a number of measures, including realizing the common goal of “complete denuclearization of the Korean Peninsula,” and pursuing talks to declare an official end to the Korean War, which devastated the Peninsula, beginning in June 1950. An armistice brought about a ceasefire in 1953, but the conflict never officially ended because the parties failed to reach agreement over a formal peace treaty. Prior to last week’s historic inter-Korean summit, DPRK leader Kim Jong Un had announced his intention to suspend nuclear tests and intercontinental ballistic missile launches, including the closure of the country’s nuclear test site, according to news reports. The DPRK has conducted six nuclear tests since 2006, and in recent years launched numerous test missiles, in violation of UN Security Council resolutions. The 15-member body has regularly reacted to these violations through punitive measures. The International Atomic Energy Agency (IAEA) monitors the DPRK nuclear programme, including through the use of satellite imagery, but its inspectors have not had access to the country’s nuclear facilities since April 2009. Following Friday’s summit between the leaders of the Democratic People’s Republic of Korea (DPRK) and the Republic of Korea, Secretary-General António Guterres and other top officials expressed hope that the two countries would swiftly implement all agreed actions, including ridding the Peninsula of nuclear weapons.